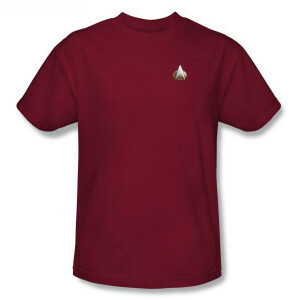 Channel your favorite command everyday with the Star Trek TNG Command Uniform T-Shirt. The simple 100% cotton T-shirt is the same burgundy color worn by Captain Jean-Luc Picard and Commander William T. Riker in the Next Generation and features a screen print of their commbadge. It is a gift for Christmas and I know my daughter is going to love it. Ordering was fast and easy and delivery was fast as well. The shirt has received compliments. It fits very well and I have washed and dried with no shrinkage. The only downside is the material could be a little softer, but it is not as rough as the Klingon shirt! My wife bought this for me for my birthday, and I love it! I feel like a true Captain Picard while wearing it. I purchased this shirt as a Halloween costume to start then wore it to school. It's now a part of my regular wardrobe. Very disappointed with the quality of the emblem. The screen printing looks cracked and faded as if it has been worn out or left out in the sun. Because the only design of the of shirt is the small emblem, it should have been made with the highest quality. I was very unhappy and embarrassed when I gave this as a gift for my boyfriend. I'm expecting the emblem wouldn't last very long.